We are classical music's greatest hits radio station. We play only the best music of the great classical composers. A profile of Classiccomposers.org was found on the social network Facebook. 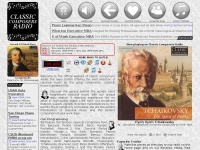 The web server used by Classiccomposers.org is run by CloudFlare and is located in San Francisco, USA. This web server runs 2 other websites, their language is mostly english.